Subscribe to a successful trader's signal and your platform will trade automatically for you! Millions of users around the world choose MetaTrader 5, attracted by the platform's exceptional advantages. 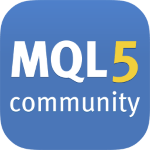 For all of these users, we have created the largest community of traders, and we invite you also to join the MQL5.community. On the community website, you can download thousands of free trading robots, subscribe to trade signals and copy deals of successful traders, discuss trading strategies and much more. Sign up now and join an abundance of trading fans!